Player and recorder with 100,000 Internet radio stations. Record targeted MP3 tracks via the Wishlist. Top Songs due to Music Taste Function. Automatic ID3 tagging, album artwork, lyrics. Audio editor. Music management with the Music Universe. Clouds. Podcasts. MusicTV. Radiotracker delivers the best and most radio stations thanks to the massive radio database, and sorts stations by genre, language, country, region and even artist. The preview function gives you live information on the music currently being played before you tune in and recommendations to similar radio stations as well. Top Songs creates a playlist of songs that matches your taste. Radiotracker uses a one-of-kind technology to automatically and legally fulfill music wishes. Click the album to get all the albums by your favorite stars. With just a single click, It rounds up all the tracks from a specific album. You can also select individual titles to record. 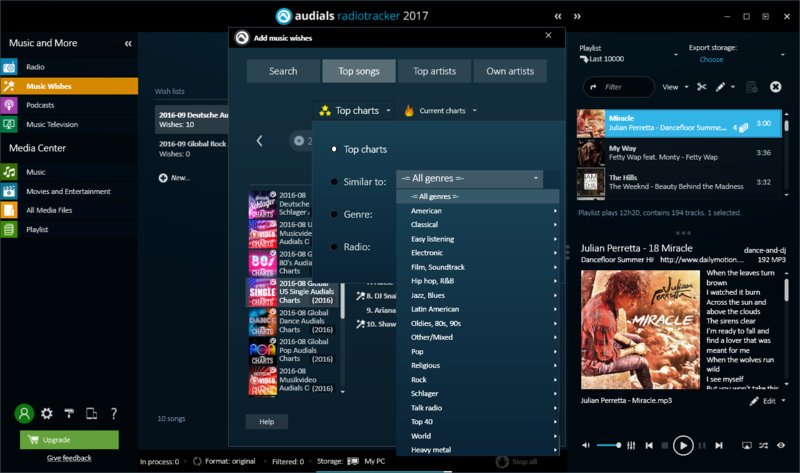 Simply select artist, album or individual song and Radiotracker uses the Audials network to find the right radio station, automatically record the desired music and save the track as a private copy on your PC with ID3-tags, album, artwork and lyrics. Subscribe to over 500,000 of episodes of 120,000 different podcasts and let yourself be entertained with non-stop Music from the best music TV stations.